It had a plausible thesis. There were lots of interesting stories to back up the thesis. I am glad I read it. Dr. Bernstein uses expert historical analysis to explain what accounts for economic growth or lack thereof in different societies at different times. His analysis is readily applicable to emerging markets today and to future biomedical technologies of tomorrow. His storytelling is compelling. Well worth a listen for students of history, economics or science! The book that every politician and head of state should read. It should also be required reading for the third world countries dictators that bring their people to misery and poverty. This book is the story of how the west came across this magic formula that brought wealth, freedoms and human rights even to the most disadvantaged members of our society. The book is full of concepts, filled with answers that I looked for, for a very long time. I wonder if anyone else tried such comprehensive explanation of the success of modern capitalism. The book and its contents are excellent, the narration is too fast, it seems the narrator is in a hurry to finish the book as soon as possible. The book itself is excellent and deserves a 5 stars, however with author in a hurry , lots of things remained unclear and difficul to follow. Only part of the book! This is an awesome book. However, the audio of this book is only part of the entire book. I would have given this 5 stars if it included the entire book. I have the actual book an it is more than worth having it all on an audio book. great story telling, most interesting data. not well divided into chapters, one can get a bit lost. This book explains - in plain English - why some societies prosper and others stagnate in poverty. It should be a must read in all schools in America. This book was quite interesting, but in the end, was not great. It just seemed like it left the subject a bit flat and could have provided more examples and proof of the theory. I also thought some of the stories could have been developed a bit more. The single most important book you can read is both short and will correct the deep ignorance installed by modern education. I own about four hundred audio books and this short one should be mandatory. 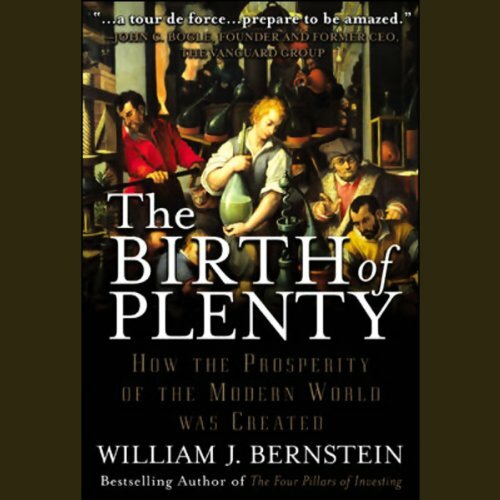 “The Birth of Plenty: How the Prosperity of the Modern World was Created” by William Bernstein. I am applaud by the doom and gloom that blights so many people people's’ lives today. Our citizens should absolutely glory in pride and humility at what 2,500 years of Western Civilization has provided the entire planet. The author presented a lot of information that was interesting but the title leads one to belief there will be more depth than is actually there. In the end we get too much information, go down too many rabbit trails, and fail to really hit the point of what we were hoping to find in the book. Well done, but it all seemed like an introduction.